National League Player of the Week honors for the period ending April 26 went to the St. Louis Cardinals' Albert Pujols. During that week, Pujols ran up a .450 batting average with 11 RBIs. He also had the distinction of driving home his 1.000 career run, which was done with a grand slam against the Chicago Cubs. 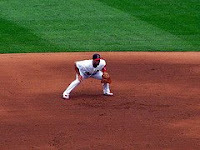 As well, Pujols stole a base three games in a row.